I came up with an idea similar to this one (us20070091093) around the same time and I've read this patent pretty thoroughly. They cover a large part of what my idea is, but I have differences in execution and the fact that it is not directly clicking on the video that they have stated. If it is close enough that my idea would fall under this patent how do I go about opening dialogue for using parts of the patent in collaboration with my device. Also, I believe my idea may be different enough, but I am not sure who I would need to ask to evaluate this claim. Any advice or assistance that you can offer would be most helpful. Thank you for your time and consideration. If it is close enough that my idea would fall under this patent how do I go about opening dialogue for using parts of the patent in collaboration with my device. BUT you should really consult with a lawyer before doing so, in order to make sure you don't wind up getting in over your head (by, say, accidentally providing them with an admission your product would infringe their patent that could later be used against you). Also, I believe my idea may be different enough, but I am not sure who I would need to ask to evaluate this claim. A registered patent attorney or agent is really the only person who can give you a competent opinion on this, but even then there's a certain amount of crystal ball gazing involved. Be suspicious of anyone who gives you black and white/yes and no answers. 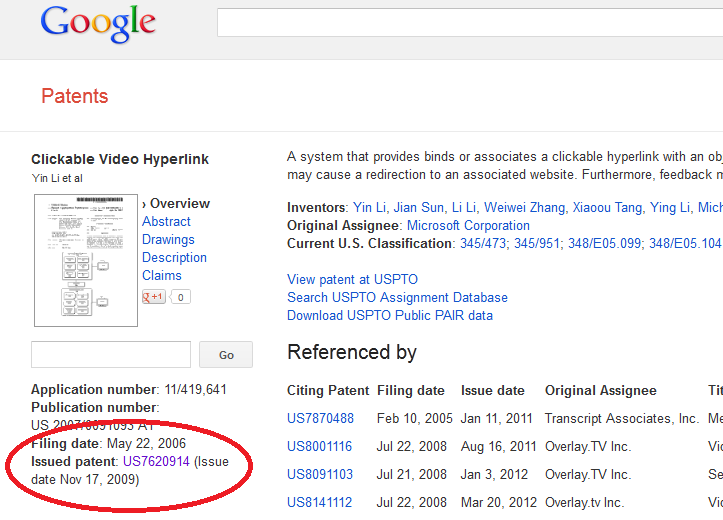 If you look at the claims of the patent that actually issued, they're quite a bit narrower. providing a separate stream that includes the hyperlink. providing a separate hyperlink stream that includes the hyperlink and the shape to be displayed in the video stream over the specified object for transmitting the separate hyperlink stream with the video stream comprising the with the sequence of multiple consecutive video frames, wherein the hyperlink stream and the video stream are transmitted by a communication interface of the first computing device for transmission over a network using a communication protocol for receipt by a second computing device, wherein, when the video stream is displayed by the application at the second computing device, the shape is configured to become visible over the object in the displayed video stream in response to placement of a cursor icon of a pointing device onto a video display of the sequence of multiple consecutive video frames in the video stream during display of the video stream by the application at the second computing device; and receiving feedback information at the first computing device on user behavior regarding the hyperlink associated with the specified object in the sequence of multiple consecutive video frames in the video stream, wherein the feedback is received from the second computing device following display of the sequence of multiple consecutive video frames in the video stream at the second computing device, wherein the feedback information includes whether a user at the second computing device activated the hyperlink associated with the specified object. However, you also have to keep in mind that the reason the scope of the application's claims were narrowed is almost certainly because there are other patents that cover that subject matter. 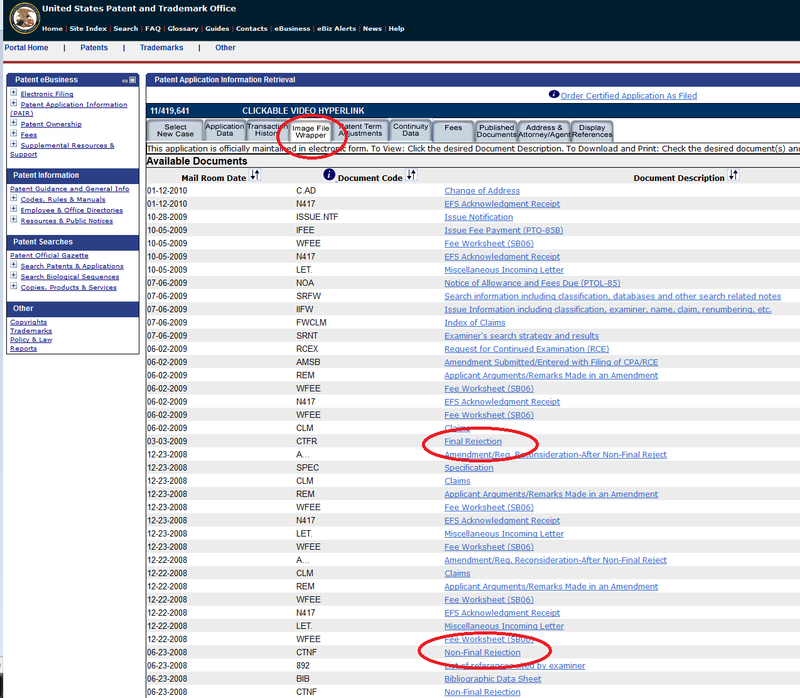 If you want to see if any of those patents cover your idea, you'll have to look up this patent's prosecution history, download the rejections the examiner issued during prosecution, and look at the references he cited against the claims. Hope that was enough information to get you started. Good luck. Not the answer you're looking for? Browse other questions tagged prior-art computer-graphics novelty us20070091093 or ask your own question. How do I determine if my product changes make it non-infringing? How do I report a application that is not novel?